If you try to install RealPlayer, a media player available at real.com, you'll notice that the setup downloads Google Chrome. 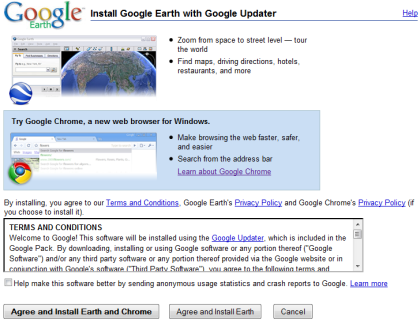 The option to install Google's browser is enabled by default and I assume that most people will not bother to disable it. 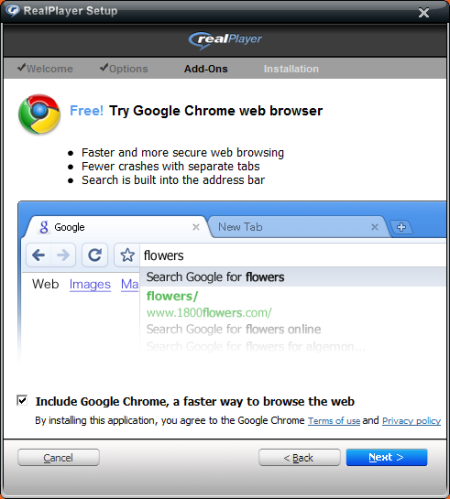 RealPlayer seems to be first third-party application used to promote Google Chrome. The browser has replaced Firefox in Google Pack and it's installed along with Google Earth if you're not paying attention. Despite being the most aggressively promoted Google product, Chrome's market share is still low: according to Net Applications, the global market share for Chrome was 1.15% in February, compared to 0.78% in September 2008. "The biggest challenge all [browsers] face is that most people don't even know what a browser is or that there's choice," told Wired.com Brian Rakowski, director of product management at Google. Thank god its not the other way around. I agree with Toby Adams, I am not a fan of real player. But happy to see Chrome is being promoted in other places. can you provide form filling facility like in m. firefox? Real player is still around? I don't think Chrome will grow in popularity until it adds support for extensions. I know I'd use it much more if it had Adblock and Greasemonkey. @flatluigi: it has greasemonkey support. Extensions coming in May. @Tekkub: Yes. Especially people who learned everything they thought they ever needed to know about software in the late 90s (I have first-hand experience to draw from on this, unfortunately). Many of the same folks still use AOL and even ICQ. I don't know which one of those programs make me flinch the most when I see it installed on someone else's computer, especially when they start raving that those programs are so good and can handle anything and blah blah blah. I have nothing against Real except the bloat and the 500 hooks it puts into your system, and I'm of pretty much the same opinion with AOL and ICQ. Do people use google chrome? Because it have only 1%. Use safari the best web browser. The main thing that is good about Realplayer, is that it can download web videos with one click. The Realplayer video download browser plugin DOES work with Google Chrome, one of the few useful 3rd party plugins available to the speedy browser from Google. In other news Real Player still exists. RealPlayer and Real are indeed still around. In fact, RealPlayer is downloaded more than 1 million times every day. So, not so sure about the coattails thing. I've been using RP with Chrome for a while and it's worked flawlessly. I personally prefer Chrome over other browsers and as a user of RealPlayer, this just makes it even better for me. Yeah, so many people think that IE is the internet. I have to use it for an online course I'm doing, it is absolutely brutal. @Alex Chitu : Do you have the percentage of Chrome users in your blog ? @Dzertyx: Here's the data for February, courtesy of Google Analytics. Personally speaking, I think Chrome is more of a competitor to FF than IE. IE's mostly about breaking people out of that "IE is the internet" thing people keep bringing up. To make a real impact against FF, Chrome seriously needs extensions. FF users want adblock and flashblock. Sure Greesemonkey is (mostly) supported, if you take the time to switch to the dev update channel. Or has that finally hit the normal releases? Without extensions, Chrome simple isn't a complete browser. For those who say Real is a bad program, you haven't installed it on your system in quite some time. I've had it on mine since 10 came out, and it's quick, is doesn't bloat, and they aren't trying to hook you like they used to. But, I guess IGNORANCE truly is BLISS. yes IGNORANCE is BLISS i have used real player for over 4 years now with little problems. you get full control of what you want to associate with it. its light on resources and runs quick and smooth people should not be so quick to judge. Well all I know is real player is badware ( http://blog.stopbadware.org/2008/01/31/realplayer-is-badware ) and google once said in its policies that it is against bad ware. Now teaming up with badware makes any sense? Why tarnish own image? Is it lost its cool?? That blog.stopbadware.org address has been changed. Achievement unlocked: Destroy Corporate Image. Yeah, sure, that's why their numbers are in the red. Realplayer is dying, or dead. I am not going into this one, it would be pointless to explain this to someone with obviously no knowledge about software. The problem that most people think IE is the internet is something I encounter several times a week, since I deploy corporate networks for small companies. Usually people use IE and are happy with it, but I still offer them the option to switch, which most take after some deliberation. I think that Chrome could be the third option, after the implementation of extensions. And don't get me started about Safari. If you install Real Player you don't deserve Google Chrome. when a chrome for linux??? A browser with real player bundled? The last one i can recall was Netscape, and is already dead by now. What's wrong with RP? I use it all the time over WMP and love it! Realplayer is garbage, it's banned in my organization. I can't tell you how much trouble that junk/bad-ware caused me. We implemented an enterprise training system based on RP and the end-user feedback (or should I say backlash) was horrendous. RP inundates your machine with malicious software - it's like herpes, it never completely goes away no matter how hard you scrub your registry. I'll never forget during our first demo to the high-level project sponsor, a RP message popped up asking if I wanted to meet hot women in my city. I'd rather be shot in the face with a gun that shoots zip-disks than use any of RP's malware. I think many people who are saying RP is badware haven't even used it for a long time. RP 11 is quick, easy to use, and it supports video formats WMP or QuickTime, iTunes and other stuff don't support. Die RealPlayer! Stop fighting to survive and just DIE ALREADY! The only thing I like about real player is that it allows me to download via a little popup button on sites like youtube. Other than that, as an actual player, it is trashware, failboatware, crudware, and many other unpleasant concepts. It crashes all the time and then has to repair its database which often partially or totally erases my playlists and on top of that the dbase repair fails to re-import all the stuff it had to begin with. The program stalls, whines, and craps out all the time. I might as well keep it around to download stuff and then play it with another program which under normal circumstances would be over complicating a ball bearing having to do the extra work seems to defeat the purpose of a machine that is supposed to do stuff for you. Isn't the Real Media format pretty much dead? I mean I know some people still use it, but there is better tech out there now (Adobe Flash embedded video for example) that is much more versatile and compatible than their format. In my opinion the only reason to install RealPlayer is to gain access to their audio/video format because there are many media control suites that do the same job and do it better. If you really needed Real Media support you could always install Real Alternative and do away with that bloated pile of obnoxious software. Google Chrome can be run on linux if you use wine. Real Media is absolutely rubbish and Google Chrome on the Mac does not come packaged with the plugin. The RM plugin does not allow video to be embedded into HTML. If anyone from RealNetworks see's this your product is useless. Haven't used RealPlayer since the late 90's. I didn't even know it was still around, tbh. Media Player Classic with Real Alternative pretty much rendered RP's bloat unnecessary. I like google crome browser..but only one thing which i want from crome is INFORMENTER...Only mozilla provides this facility....i hope that in future crome has this adds on..!!!!! !